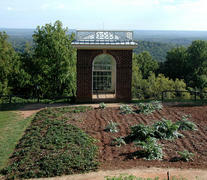 The Vegetable Garden's dramatic setting is enhanced by the pavilion that Jefferson noted "for the center of the south long walk of the garden" in a manuscript dated ca. 1807-1810. Built along the outer edge of the vegetable garden terrace, it was distinguished by its double-sash windows, Chinese railings, and pyramidal roof. According to one account, Jefferson used the pavilion as a quiet retreat where he would read. It was reputedly blown down in a violent wind storm in the 1820s but was reconstructed in 1984 based on Jefferson's notes and archaeological excavations.